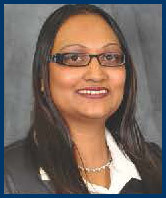 Natasha Bridgmohan is a Mortgage Broker with Mortgage Intelligence. With a vision to transform the financial services sector, she and her team of expert mortgage brokers are making a significant impact – one client, one mortgage, at a time. In a short span of seven years she has facilitated funding of more than 100 million dollars in mortgages. Her sound knowledge, expertise and years of practical experience in the mortgage and financial services industry makes Natasha a leading voice and thought-leader that both clients and industry associates look up to. She ably leads her team of mortgage brokers to deliver value-added, personalized mortgage services through Canada’s leading mortgage brokerage firm Mortgage Intelligence. Natasha’s designation as an Accredited Mortgage Professional (AMP) is a reflection of her strong commitment to the highest standards of ethics, excellence, education and an in-depth knowledge of the industry and its product offerings. She is also qualified as a Certified Residential Mortgage Specialist & Licensed Mortgage Broker. In addition, she is an active member in good standing with CAAMP – the Canadian Association of Accredited Mortgage Professionals, IMBA – Independent Mortgage Brokers Association, Vaughan Chamber of Commerce, Toronto Construction Association and CFIB – Canadian Federation of Independent Business. Natasha Bridgmohan is proud of her strong commitment and willingness to help others succeed. As a charismatic, energetic and motivated leader, she attributes her focus on genuine care and service to others as the key reasons for her success. Her passion for exceptional customer service and complete client satisfaction is evident in her continuous efforts to provide mortgage services that add value and meet every client’s mortgage needs. Natasha’s mission is to change the face of the financial services and mortgage industry. She strongly believes that this can be achieved through customer education, tailor-made mortgage solutions and superior customer service. She inspires her team to consistently meet and exceed each client’s mortgage goals and realize their home and property ownership dreams. If you want to get the most from your mortgage – now and in the years to come – talk to Natasha Bridgmohan. Contact Natasha Bridgmohan today to schedule a no-obligation consultation. We will review your mortgage goals and provide expert advice to ensure a stress-free mortgage experience. Call us toll-free at 1-866-553-7467 Ext 221 / 905-851-8871 Ext 221.